Majestic Mournes rise above the smog. 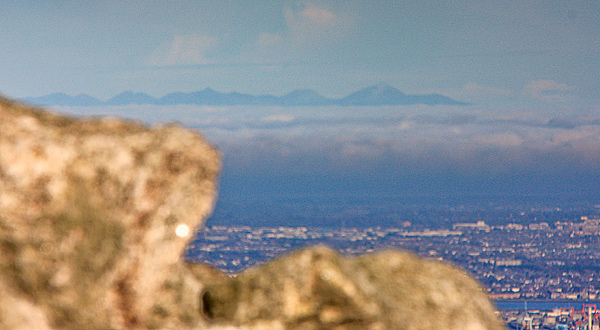 From Two Rock (aka Fairy Castle) in the Dublin Mountains, the silhouette of the Mournes stood out well today (14 Nov 10). Lower down the slope the distant view disappeared into what looks like a layer of thicker darker cloud probably kept below a particular height by a temperature inversion. The ("Great Circle") distance to Slieve Donard is 107km. The blob to the left is the out of focus cairn on the Two Rock summit.